January 2010. 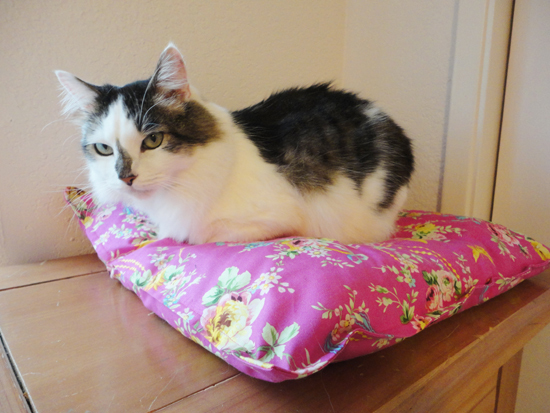 I decided that I wanted my first sewing project to be a cat bed. Not only was this my first sewing project, but my first time ever using a sewing machine. 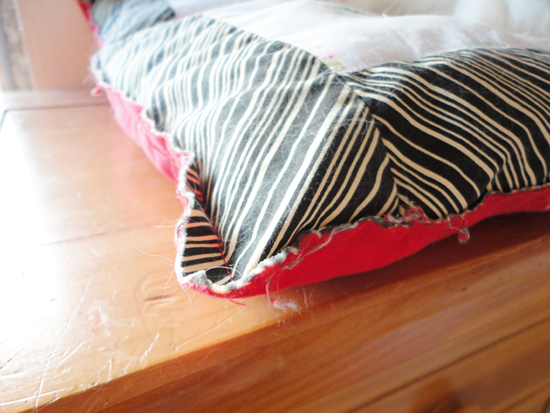 Using some cheap fabric and stuffing I sewed the bed, wrong sides together. I showed it to my husband's family member and she asked how I was going to finish the raw edges. What are raw edges??? December 2012. The cat bed has seen better days. It's been washed a ton, the stuffing is flat, the raw edges are unraveling, and the colors aren't as vibrant. It's ugly. Stella loves her new bed! It's definitely more her style. Instant gratification projects can be so fun! Do you still have the first thing you ever sewed? aww Stella totally approves. very cute. Dear god no! The first thing I made was a dress with a lined bodice. When I started, I read the directions for staystitching and decided that I didn't need to staystitch. And needless to say, the neckline stretched out. I also decided that I didn't need to grade up my waist size, making the dress very uncomfortable to wear. On top of all of that, I used cheap quilting cotton (and it showed). Why don't I have it anymore? I wore it until there were holes in it!! :P I just loved that dress. That's so cool that you wore it so much! Aaaw, what a cute blog post and what a huge improvement ;o) To be fair, I had no idea what a raw edge was back then either! I recently cut up the first thing I ever made (a wonky dress) so I can use parts of it as muslin...hehehe! Thanks, Marie! I also need to cut up some wonky dresses for "parts." sweet Stella :) I think my dad still has a pillow I hand stitched for him. I drew and cut out a cowboy riding a horse on some blue felt. I hand stitched it to some white fabric that I made a pillow with. It's pretty small, not really functional--that's probably why it's lasted so long. lol The first time I used a machine to sew was in a class, and the first project was a drawstring bag (no idea where it is now). That is so cute and thoughtful and perfect for your dad! I bet he loved it! He is so cute and stylish with that scarf! Naww! How cute is Stella :D This is a fab project and there is something really rewarding about tackling something you have made before and seeing the evolution of your rad skills. Yes I do. 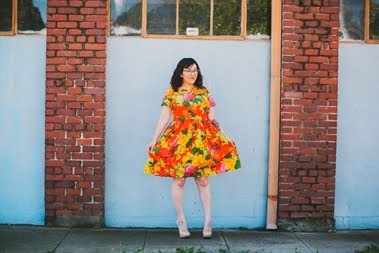 It went all out with the first thing I ever sewed - a fully lined dress. I wrote about it here"
Ummm I can't believe that was your first sewing project!!!! Stella looks so cute on her pretty new bed! I still have my first project from when I started sewing as an adult. They are a pair of flannel pajamas with cows on them. My first sewing project as a kid was tiny Barbie clothes. No wonder I got frustrated and didn't think sewing was fun! Do you still wear the pants? I want to make some pajama pants! What do you use the bean bag for? I used to have a stuffed animal dog that wasn't technically a stuffed animal because it was filled with beans and I loved it! I'm not sure what you call it over there, but here a bean bag is a really big fabric bag filled with polystyrene balls and there is only one thing you can use it for.... sitting in! The first thing I ever sewed was I think a little decorative pillowcase. I was a very little girl, probably 9 years old. I have no idea where it is. 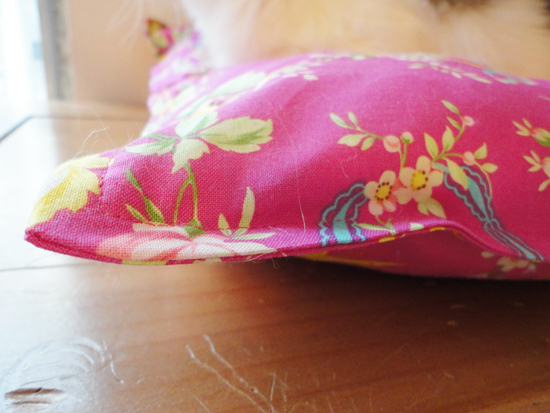 OH god I think the first think I ever sewed was an eye pillow!! I want to make an eye pillow with some lavender in it! The first thing I ever (successfully) sewed was a little red tie for my son. He's four now, and he refuses to wear any other ties. I cringe. Oh, the new bed is so cute! I love it! Let's see, I sewed a little velcro pouch in my first sewing class, then I sewed a dress (by which I mean a rectangle with head and armholes, ha). 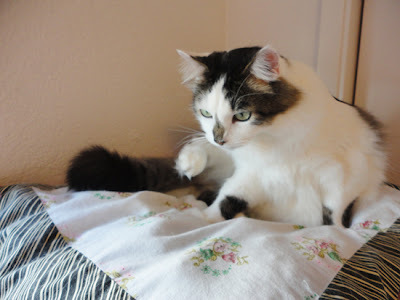 I recently chopped it up-- I didn't finish the seams and they unraveled like CRAZY. Oh, my first few projects don't have finished seams either! I had to think about this for a moment, but yes, I do still have the first thing I sewed. It's yellow apron I made in 4H when I was nine. It came down to my knees; last time I tried it on it looked like a loin cloth. I'll have to drag that out the next time I go to visit my parents. Stella is sooooo pretty! I loved reading this post! I love looking at other peoples first projects as they are a really good way to chart your progress. I think one of the first things that I made was a vest in clothing class in high school, my mom actually still wears it! Awww that's so cool that your mom wears it!!! Aww that is so cute! 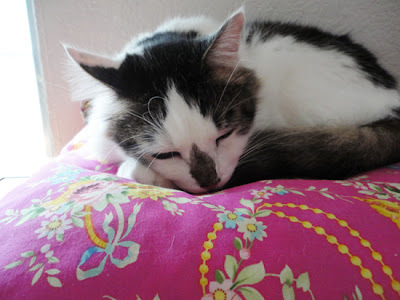 I love the fabric you used for the new bed. That cat bed is so adorable! LOVE the pink fabric you used!